Scenario: I installed the plugin but I am not receiving any of the items. description: Replace Name with the name of the specified item and WorldName with the name of the world to receive that item. description: Gives permission to get all the items from the specified world. just add permission-node: 'itemjoin.ultra' to your item. You can change the permission node to whatever you want just add the permissions to a permissions plugin afterward. This is because of java restrictions and hopefully will change in the future. Sometimes certain permissions plugins fix this but in reality, it depends on the permissions plugin you use. Scenario: I modified one of my config files... but it keeps resetting itself. Example; I have added new items to my items.yml or removed some of the default items from the items.yml and it is causing my items to not save. It resets itself back to the default items.yml and a new one is generated with numbers. This is because, when you modified the config file, you lost some spacing; "Correct Structure". YAML files are very, very specific and if there is a single missed space it won't be happy and it will throw a lot of error codes. An easy fix for this is to copy your modified YAML file, it should have been saved (with numbers) such as; items231233.yml. Then click Validate and it will tell you exactly where the issue exists. Scenario: I am having issues with PlaceholderAPI and placeholders not formatting correctly. You are seeing this issue because you need to download vault-extension from the cloud, you can do this by typing /papi ecloud download Vault. PlaceholderAPI will then download this extension and you will need to restart your server for this to take effect, now any vault placeholders will work! If you need other extensions just look through the list /papi ecloud list all. Scenario: I am having issues with Chest Commands GUI. Example; I have a custom command bound to a menu but when I execute the command using an ItemJoin item it says unknown command! 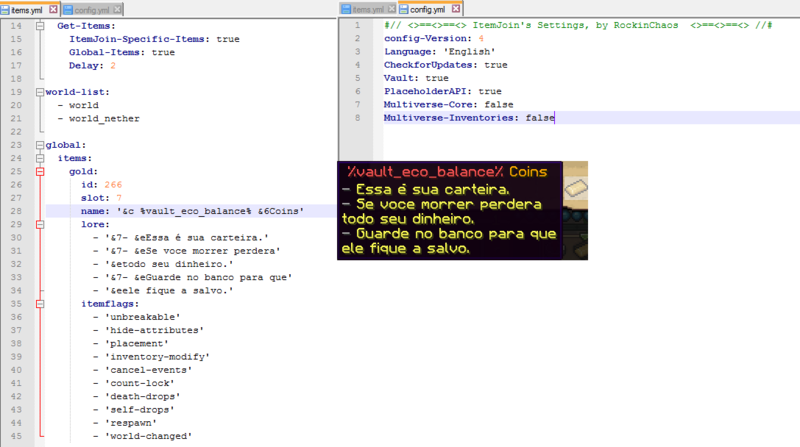 The best way I can explain it is the custom commands that are registered from his plugin are not real. They are ghost commands that are registered after ALL of your plugins are done being enabled. Therefore we cannot grab the command or communicate with it in any way. The easy solution though is to use ChestCommands RAW commands. You would want to use /cc open [file] and [file] is the name of the file in the ChestCommandsGUI folder, such as I named this menu options. As long as its not a custom command you created within ChestCommands, it will work. Scenario: I am having issues with MyCommand. Example; I have created a custom command but when I execute the command using an ItemJoin item it says unknown command! MyCommand has implemented a way for other plugins to use their commands via raw commands. I created this in the MyCommands.yml. I need the /gm part. This will set the user who ran the item command to creative. %player% gets the user who ran the item command. Makesure you include a / when you type the command from mycommands. console: mycmd-runas player %player% / is required as it is the basics to start at. If your issue is not listed please send me a direct message or open a bug report on ItemJoin's Github Repository and I will get back to you ASAP. If you need to get a hold of me quickly, feel free to join the Discord Server!